So we are officially done in Florida and en route to Korea. We are staying with my parents for 2 weeks in State College, PA or as we Centre County residents call it, “Happy Valley.” It’s nice to chill and take a deep breath from all the chaos we endured the past few weeks. I was very sad to leave Florida because of all my friends, I wish I could take them with us. We did have some great times with them. We spent the night before Christmas Eve at Steve and Rachel’s where we had a BBQ with Larry, Sharon, Kareen and the Conards. Only in Florida do you BBQ on the night before Christmas Eve. This is a gift I brought to Leeann’s 10 For 10 Secret Santa. Coincidentally I pulled Leeann as her Secret Santa. In this package is a basket of Homemade Spicy Cranberry Jam, Homemade Orange Marmalade, and some Scrapbook Embellishments. 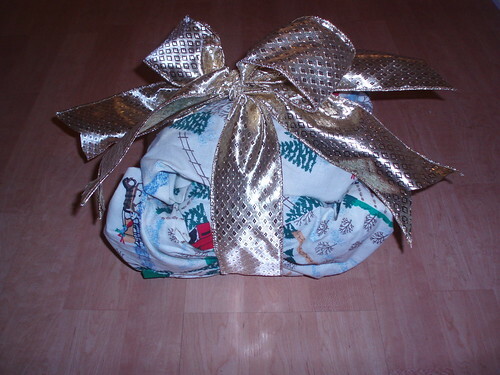 I then wrapped the basket with a handmade vintage Christmas apron and tied it with a big bow – voila, Santa eat your heart out. Another gift I made this year, despite my busy packing and moving schedule was a little something for Rachel and Steve’s new baby, Gibson Wayne Conard. Little Gibbie was born Dec. 4th at 3:01 PM. 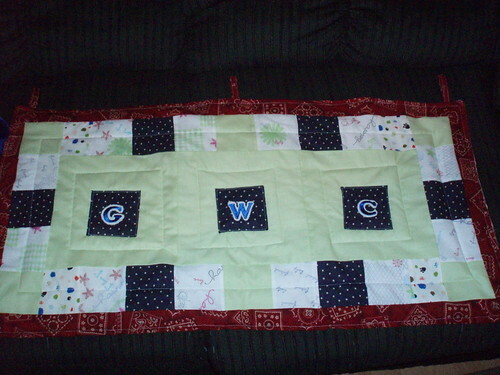 The story behind this wall hanging is that we (the teachers at school) had a baby shower for Rachel in November where we used stamps to decorate fabric squares which would be used to make something for the baby. You can see the swatches are the squares with words and flowers on them. 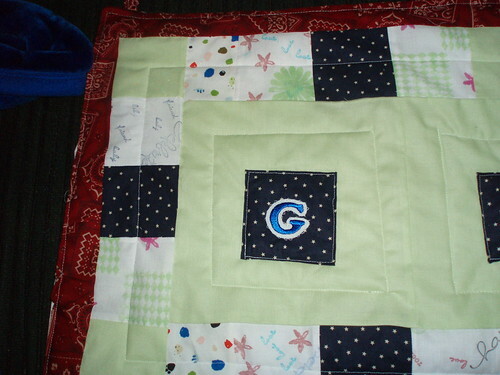 I then took the stamped squares and quilted them with some scraps Rachel had from making Gibson his baby quilt. I sewed on some monogram patches and ta-da, a wall hanging for a very special little man! Well that’s all for toady, hubby is already asleep and snoring next to me and I am off to bed now too.